Hoping an Emergency never happens but being ready if it does. The Board of Ada County Commissioners is authorized and required by Idaho Code § 46-1009 to maintain a county-wide disaster preparedness agency and, for that purpose, has established the Ada County Department of Emergency Management. 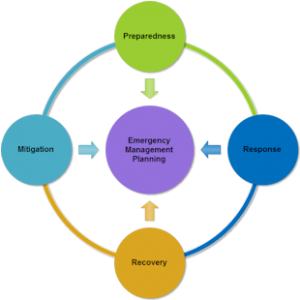 Ada County Emergency Management works closely with other local, state, and federal agencies to help the community mitigate, prepare for, respond to, and recover from all technological and natural disasters and emergencies in Ada County. Doug Hardman is the Emergency Management Director. We are located in the Vernon L. Bisterfeldt Public Safety Building at 7200 Barrister Drive in Boise. Our normal business hours are 8am – 5pm, Monday through Friday. Identify hazards and risks that may affect residents of Ada County. Inventory specialized resources such as supplies, equipment, facilities, and personnel. Develop inter-governmental emergency response plans that address roles and responsibilities during emergencies and disasters. Ensure coordination and communication between government agencies, business and industry, and volunteer agencies. Provide public education and information on personal safety, disaster preparedness and hazards in Ada County.